More details on the benefits of a regular Yoga practice. Discover how to: lose weight, eliminate your stress, increase your flexibility, build your strength, ease back pain, build your bones and better your balance through a regular beginners Yoga practice. * Help you lose weight: Many forms of yoga raise the heart rate into the aerobic range. But you don’t need to exert yourself to lose weight with yoga. Some studies show even gentle yoga and breathing techniques rev up your tired metabolism so you can lose weight. A study at the Fred Hutchinson Cancer Research Center in Seattle linked yoga and weight loss. This study of over 15,000 men and women showed people who did yoga lost weight while the control group gained weight. Another study presented last year at the America Heart Association found yoga helped overweight high school students lose weight while the control group gained weight. And the famed Dr. Dean Ornish encourages his patients to practice yoga to help ensure weight loss. When you do yoga and make it part of your lifestyle, you’ll soon discover it’s power for weight loss. Yoga helps you to lose the weight in varied ways. It helps you build muscle mass. When you increase your muscle mass, you boost your resting metabolism — and that makes your body burn more calories. You strengthen your body from tip to toe with a regular practice. The thyroid gland normalizes your weight without you having to be in the gym 4-6 days a week. There are a number of factors involved in the normalizing of the weight. Some of the poses in a practice stimulate sluggish glands to increase their hormonal secretions. The thyroid gland, especially, has a big effect on our weight because it affects body metabolism. Yoga goes even deeper by changing the relationship of mind to body, and eventually to food and eating which can have a tremendous impact on weight loss. * Eliminate your stress: Yoga reduces the physical effects of stress on the body. By encouraging relaxation, you help on lowering your levels of the stress hormone cortisol. Cortisol is a chemical that is linked to increased belly fat. Big bellies are linked to insulin resistance-a precursor to Type 2 (adult-onset) diabetes – and heart disease. By combating stress, yoga helps to normalize cortisol levels and keep belly fat to a minimum. Related benefits include lowering blood pressure and heart rate, improving digestion and boosting the immune system as well as easing symptoms of conditions such as anxiety, depression, fatigue, asthma, and insomnia. Your lung capacity will improve, and so will the quality and depth of the breath. People who practice on a regular basis will notice that they will have less upper respiratory infections, this is thought to be because of the quality of your breath one practices in a yoga practice. *Improve your flexibility: Yoga helps to improve flexibility and mobility, increasing range of movement and reducing aches and pains. Many people can’t touch their toes during their first yoga class. Gradually they begin to use the correct muscles. Over time, the ligaments, tendons, and muscles lengthen increasing elasticity, making more poses possible. Yoga also helps to improve body alignment resulting in and helping to relieve back, neck, joint and muscle problems. Many people think that they need to be flexible or need to be able to touch their toes to do yoga. Not so! You come to yoga with however your body is at the moment, and with working through your practice, work towards a more flexible body! * Build your strength: Yoga postures use every muscle in the body, helping to increase strength literally from head to toe. When I restarting taking yoga about 8 years ago, I could only do one pushup. After being in a regular practice for three months, I could at the end of those three months do 19 pushups! I was truly amazed at this feat and was hooked on yoga from that point on. While the different poses in a practice can strengthen the body, they also provide an additional benefit of helping to relieve muscular tension. Lots of people have upper body tension, due to being at a desk or car or at the computer for a lot of the day. Coming to a session, helps to build the upper body strength, and to relieve tension being held in the body, so you get the benefit of increasing strength and easing body tension. * Remember, you don’t have to be flexible, or in shape to do yoga. If you can breathe you can do some form of yoga. The more out of shape that you are, the more you’ll see immediate results in a regular practice. Please join me in a gentle beginning yoga class. What happens in a class is for the first time, you’ll register and sign in, I’ll discuss with you any body issues that you may have (back, carpal tunnel syndrome, balance, surgeries, high blood pressure, etc. ), Class is typically 60 minutes in length. Each class will begin with a warm-up and stretching. The warm-up is then followed by focused breathing, then a series of poses that gently work the entire body. After the exercises, there is a period of physical and mental relaxation and reflection. Participants do not need any prior experience (I love beginners!!) to attend. All skill levels are welcomed. You may borrow a yoga mat, but I encourage you to purchase a yoga mat of your own. Blankets, blocks, straps are provided for you to use during your practice. Where? I teach Hatha Yoga for the National MS Society, an adaptive chair yoga class on Thursdays at 10:00 AM at Wesley United Methodist Church, 3515 Helena Avenue, Nederland, Texas 77627. 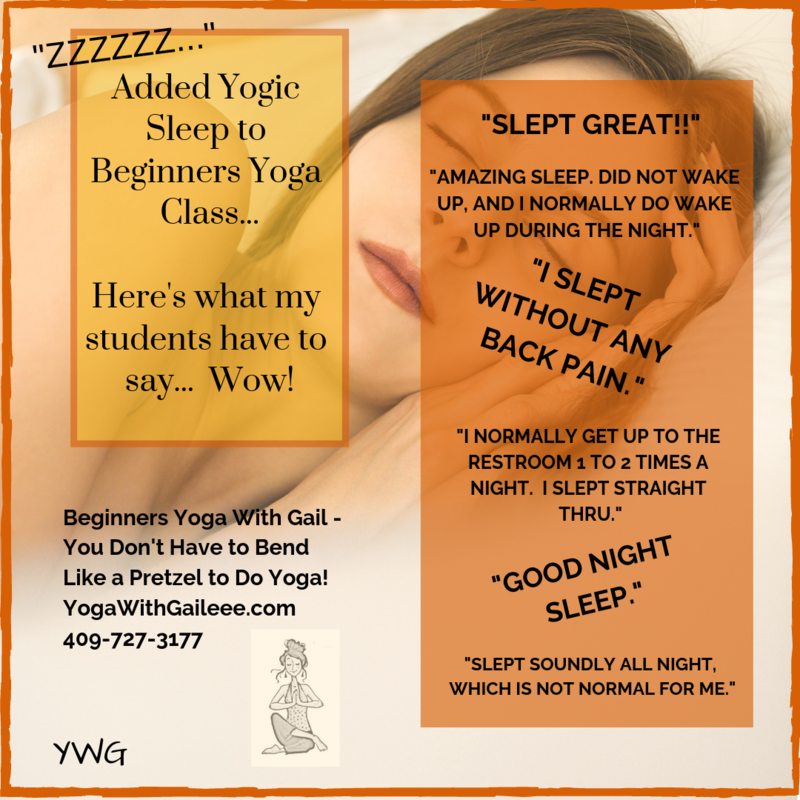 Please email YogaWithGaileee@gmail.com or call (not text) at 409.727.3177. Wesley United Methodist Church in the Christian Life Center. Free Childcare available upon 48 hour request, with a $20 deposit. Gentle Yoga class to: ease back pain, lose weight, lessen stress, increase flexibility and gain strength. Your body will say “Ahhhhhhhhh”.